Oh Grace and Frankie. If you haven't already seen this Netflix original offering then please do yourself a favour and check it out. Now. Seriously, you won't regret it. Not only is it so refreshing to see two older women as leading characters on your little old telly screen. And portrayed as actual real life, normal people, for once rather than someone's grandma seemingly void of her own thoughts and opinions. There is also some pretty juicy outfit inspo in there too. First thing's first, Jane Fonda is a blood legend. She is probably worthy of her own separate blog post because I could wax lyrically for days about my love for this woman and her endless contributions to the world via fitness videos and fashion. But Queen Jane is not the only star of this show. 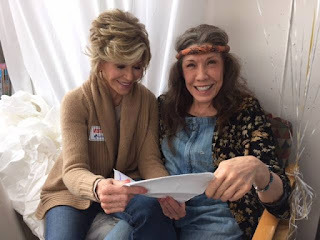 Lily Tomlin features next to Fonda (often in a pair of dungarees) and is equally marvellous. Not only has Tomlin's character inspired countless outfit choices for me but she also shows how your style doesn't have to change with age. Often seen rocking a head scarf and band tee, Frankie nails effortless cool better than any twenty-something IT girl ever could and proves that age means nothing when it comes to good style. If this still isn't enough to sell this juicy T.V offering to you, then the pair's liberal attitude towards early morning alcohol and creation of their own lube business should just about do it. I know. Thank me later.